Jobbik sign featuring oligarch Lőrinc Mészáros and Prime Minister Viktor Orbán: “You Work. They Steal” (photo: Orange Files). On June 23, 2017 Fidesz–Christian Democratic People’s Party (KDNP) National Assembly representatives adopted legislative amendments that required political parties to pay the registered list price from the previous calendar year for outdoor advertising (source in Hungarian). The official justification for the amendments was that they would “contribute effectively to the reduction of the risk of corruption” (source in Hungarian). The specific purpose of the amendments, one to which Fidesz officials alluded on several occasions, was to prevent former Orbán-government oligarch Lajos Simicska from providing Jobbik, the nationalist opposition party that he began supporting after his dramatic rift with Prime Minister Orbán in 2015, with free or discounted advertising space through his outdoor advertising company Mahir Cityposter. These amendments are known conventionally in Hungarian as the “[billboard] sign law” (plakáttörvény). 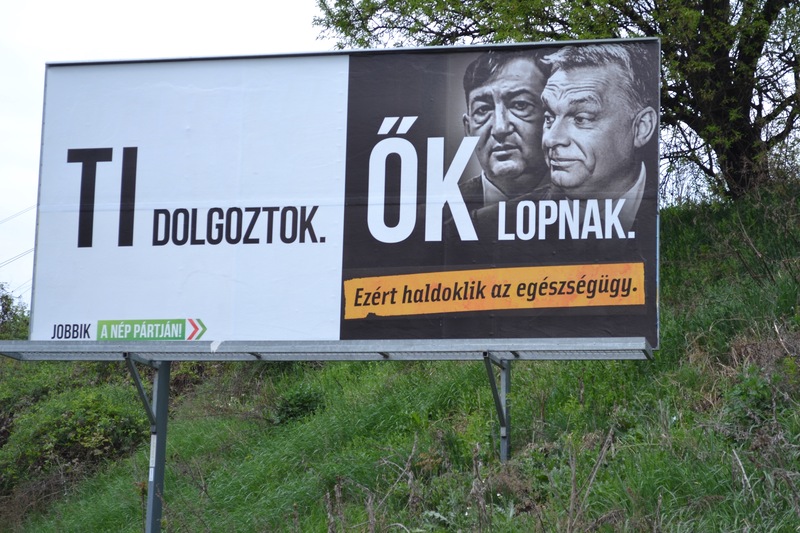 On April 1, 2017, Jobbik launched a major outdoor-advertising campaign featuring signs that showed the faces of Prime Minister Viktor Orbán, his chief strategic advisor Árpád Habony, Cabinet Minister Antal Rogán and Fidesz oligarch Lőrinc Mészáros above the text “You Work. They Steal” (source in Hungarian). 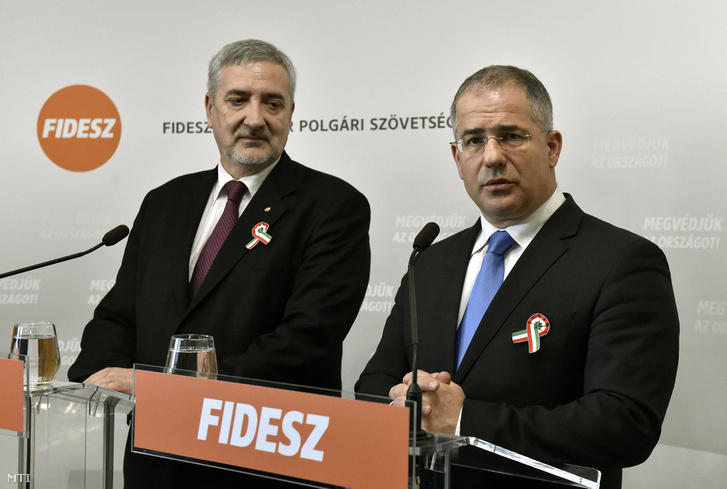 On April 2, Fidesz National Assembly caucus Deputy Chairman Szilárd Németh declared during a press conference that the advertising campaign represented “ultimate evidence that Jobbik is the party of a billionaire. This naturally refers to Lajos Simicska, who manipulates Gábor Vona and all of Jobbik like a marionette” (source from 0:10). 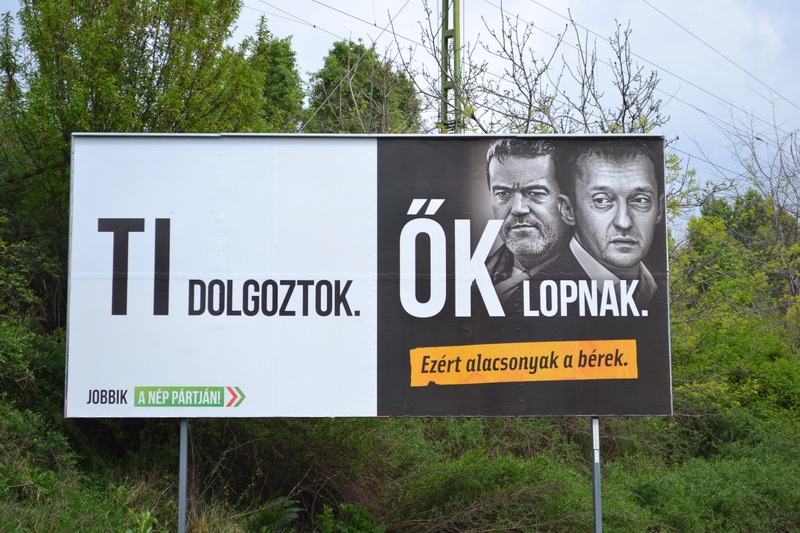 Neither Jobbik nor Simicska denied speculation that the party was conducting its advertising campaign on billboards under the ownership of the former Orbán government oligarch’s company Mahir Cityposter. On June 17, Jobbik announced that the party had spent 54 million forints (approximately 175,000 euros) to display the anti-government signs on 2,468 large billboards and 300 small billboards during its two-month advertising campaign. The opposition newspaper Népszava estimated that Jobbik therefore paid less than one-third of the market cost for the outdoor-advertising space on which the party displayed the signs (source in Hungarian). In numerous cases, the suspicion arises that billionaires and financial groups connected to them want to influence democratic electoral competition and want to distort the chances of those who participate in elections. This practice, in addition to posing a threat to the purity of elections, entails the risk of covert party financing and corruption. The objectives of the proposal [proposed legislation] are to prevent the veiled attempts of billionaires to acquire influence, to increase transparency and, furthermore, to ensure that certain parties do not become beholden to business enterprises that finance their election campaigns in a corrupt manner. obliged entities that sell outdoor-advertising space to political parties to notify the State Audit Office of the party or parties to which they had sold the advertising space and of the amount of money they had charged for this space within 15 days of the enactment of the law. Outdoor-advertising bill sponsors János Halász (left) and Lajos Kósa discuss “Lex lackey” (photo: MTI). On May 3, 2017, the co-sponsors of the bill, Lajos Kósa and János Halász, held a press conference during which they referred to the proposed legislation as “Lex Lackey” (lex csicska), thus alluding to Prime Minister Viktor Orbán’s statement to Jobbik National Assembly representatives several weeks earlier that “We all know that you do not uphold your own opinions—you are sitting in the pocket of a big businessman. You have transformed Jobbik from a radical-nationalist party into a lackey [csicska] party” (sources A and B in Hungarian). According to Kósa, “With Lex Lackey we want to prevent parties from becoming simple lackeys in the hands of billionaires . . . billionaire Lajos Simicska has bought Jobbik by the kilo in a clearly visible and by now openly assumed manner” (source in Hungarian from 1:57). On June 14, 2017, the National Assembly rejected the proposed “sign law” by a vote of 131 in favor to 61 against (source in Hungarian). All representatives from the Fidesz-KDNP governing alliance voted in favor of the bill, while all representatives from opposition parties voted against the proposed legislation. Fidesz-KDNP officials had previously believed that a sufficient number of opposition representatives might be prepared to support the bill in order to attain the two-thirds majority required for its adoption. On June 22, 2017, the Simicska-owned television station HírTv obtained a copy of amendments to Law LXXIV of 2016 “on protection of the appearance of municipalities” that Fidesz-KDNP members of the National Assembly Legislative Committee would submit for immediate consideration during an extraordinary session of the legislature the following day and which would enable the governing parties to attain the same objectives as those contained in the rejected “sign law” with support from a simple majority of parliamentary representatives (source in Hungarian). These proposed amendments stipulated that organizations that receive government budgetary funding—which includes political parties with representation in the National Assembly—would be required to pay the official list price from the previous calendar year for outdoor advertising space unless they obtained a lower price through public-procurement procedure. The proposed amendments obliged organizations that receive government budgetary funding to provide relevant authorities with a copy of any contracts concluded for the purchase of outdoor-advertising space and instructed these authorities to remove the advertising within a period of two days if the terms of the contract were not fulfilled. The proposed amendments specified fines of 150,000 forints (487 euros) per sign found to be in violation of the stipulated regulations (source in Hungarian). On June 23, the National Assembly adopted these amendments to Law LXXIV of 2016 “on protection of the appearance of municipalities” by a vote of 123 in favor to 68 against. All representatives from the Fidesz-KDNP governing coalition voted in favor the amendments, while all opposition representatives voted against them (source in Hungarian). On June 30, President János Áder signed the amendments into law (source in Hungarian). On July 14, 2017, Jobbik submitted a retroactive challenge to the approved amendments to the Constitutional Court after obtaining the 57 signatures of National Assembly representatives needed to tender the appeal (25 from the Hungarian Socialist Party, 24 from Jobbik, 4 from Politics Can Be Different and 4 from independents). Jobbik’s challenge to the constitutionality of the amendments was based on the claim that they represented legislation concerning the “regulation of the operations and management of political parties” and thus would have required support from a two-thirds majority of National Assembly representatives in order to be adopted (source in Hungarian). Jobbik sign featuring chief advisor Árpád Habony and Cabinet Minister Antal Rogán: “You Work. They Steal” (photo: Orange Files). On June 8, 2017, the pro-government daily newspaper Magyar Idők reported that Hungary’s National Tax and Customs Authority (NAV) had launched an investigation of Simicska’s outdoor-advertising companies Mahir Cityposter and Publimont to determine if they had underreported the amount of advertising space they had sold to Jobbik (source in Hungarian). 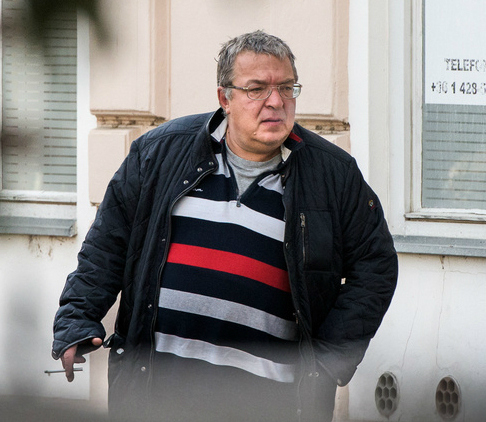 On June 12, armed NAV investigators seized financial documentation pertaining to the first four months of 2017 at the headquarters of Mahir Cityposter (source in Hungarian). On June 15, NAV auditors conducted an investigation of financial records at the offices of Publimont and Mahir Cityposter’s parent company, Mahir Ltd. (source in Hungarian). On October 27, Magyar Idők reported—citing National Tax and Customs Authority records—that NAV had uncovered a 75-million-forint (241,670-euro) tax shortfall in Publimont’s sale of outdoor advertising space to Jobbik (source in Hungarian). On August 10, 2017, Hungary’s State Audit Office (ÁSZ) initiated an investigation of Jobbik’s party finances (source in Hungarian). On October 3, the State Audit Office—which is responsible for monitoring the financial activity of organizations that receive government budgetary funding—filed a complaint with the Budapest District 11 and District 22 Public Prosecutor’s Office claiming that Jobbik had refused to provide ÁSZ with requested documentation (source in Hungarian). Jobbik officials asserted that the party had been cooperating with the State Audit Office investigation (source in Hungarian). On October 6, the Budapest District 11 and District 22 Public Prosecutor’s Office launched an inquiry to determine if Jobbik had refused to comply with the State Audit Office’s requests for financial documents (source in Hungarian). On December 6, the State Audit Office charged that Jobbik had accepted 331.7 million forints (1.05 million euros) in illegal non-monetary support from a legal entity during the first half of 2017 (source in Hungarian). According to law, if Jobbik cannot disprove the State Audit Office’s finding, the party must pay a fine equaling the amount of illegal non-monetary support that the party received. Moreover, the amount of money allocated to Jobbik from the government budget will be reduced by an identical sum (source in Hungarian). Shortly after ÁSZ announced its finding, Jobbik National Assembly caucus Chairman János Volner stated during a press conference that the prospective 664-million-forint reduction in its budget could prevent the party from participating in the general election expected to be held in Hungary during the spring of 2018 (source in Hungarian). On June 29, 2017, the opposition news website 24.hu reported, citing documents received from an unnamed source, that Fidesz had purchased outdoor advertising space for the party’s 2010 National Assembly election campaign from Simicska-owned Mahir Cityposter at a cost of just over two percent of the list price for such advertising. According to 24.hu, Fidesz purchased approximately 4,700 outdoor advertising spaces from Mahir Cityposter in April 2010 at a cost of 23.2 million forints, whereas the list-price cost for this advertising space would have been around one billion forints (source in Hungarian).